A $34 million solar instrument package to be built by the University of Colorado at Boulder, considered a crucial tool to help monitor global climate change, has been restored to a U.S. government satellite mission slated for launch in 2013. The package will be built by CU-Boulder’s Laboratory for Atmospheric and Space Physics for the first flight of the National Polar Orbiting Operational Environmental Satellite System, or NPOESS. The instrument package had been canceled during the 2006 restructuring of the NPOESS program, a joint venture of the National Oceanic and Atmospheric Administration, NASA and the Air Force. Known as the Total Solar Irradiance Sensor, or TSIS, the CU-Boulder package will fly on the first flight of NPOESS in 2013 and is anticipated to fly on two subsequent NPOESS missions slated for 2015 and 2020. The two latter NPOESS missions are expected to bring in an additional $30 million to CU-Boulder, said LASP Senior Researcher and TSIS Project Manager Tom Sparn. TSIS consists of two instruments, including the Total Irradiance Monitor, or TIM, which measures the total light coming from the sun at all wavelengths, “a fundamental quantity for determining the energy balance of the planet,” said TSIS principal investigator Peter Pilewskie of LASP. The second CU-Boulder instrument, the Spectral Irradiance Monitor, or SIM, will measure how the light from the sun is distributed by wavelength, which is needed to understand how it interacts with Earth’s surface and atmosphere, Pilewskie said. The data from these instruments will help scientists differentiate between natural and human-caused climate change, said Pilewskie. The project will involve about 30 scientists and engineers at LASP during its peak, as well as 10 additional support personnel from Colorado and about 10 more from outside of Colorado, said Sparn. The mission also will involve about 15 to 20 CU-Boulder undergraduate and graduate students, who will be doing hands-on engineering and data analysis. The TSIS instruments will be operated remotely aboard NPOESS from the LASP Space Technology Building at the CU Research Park. The NPOESS satellite will be about the size of a large bus, while the TSIS instruments are about the size of a bus’s engine, said Sparn. LASP has been making solar radiation measurements from orbit since NASA’s Eighth Orbiting Solar Observatory, known as OSO-8, was launched in 1975 and continued with the Solar Mesosphere Explorer Satellite that was launched in 1981, said Sparn. Since then LASP has launched solar instruments on the Upper Atmosphere Research Explorer satellite, or UARS, the Solar Radiation and Climate Experiment, or SORCE, and the Thermosphere Ionosphere Mesosphere Energetics and Dynamics satellite mission, known as TIMED. 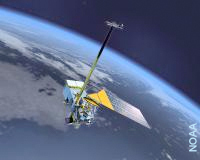 LASP’s TIM instrument, first launched in 2003 on NASA’s $100 million SORCE satellite that was built and is managed and controlled by LASP, also will fly on NASA’s 2009 Glory mission to “bridge the gap” between SORCE and NPOESS. In addition, a $39 million LASP solar monitoring package known as the Extreme Ultraviolet Variability Experiment, or EVE, will fly on NASA’s upcoming Solar Dynamics Observatory slated for launch in late 2008 or early 2009. LASP also will be monitoring the sun at the very shortest wavelengths of light by flying the $54 million EUV and X-ray Irradiance Sensors, or EXIS, on the GOES-R mission to be launched in 2014.